Wishing all our field trial and bird dog friends a Merry Christmas and a wonderful holiday with their families and friends. Strideaway is an online publication founded in 2008. 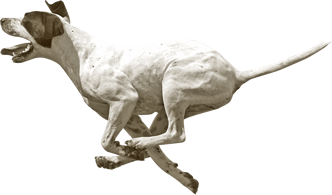 We are dedicated to promoting the great sport of American pointing dog field trials, in particular American Field sanctioned trials for pointers and setters. Our objective is to present the voices and ideas of experienced trainers, handlers, breeders and other knowledgeable participants and enthusiasts from the past to the present — amateurs and professionals alike. Whether All-Age or Shooting Dog, Horseback or Walking Trials, we place particular emphasis on wild bird field trials and the dogs that compete in them. We present richly illustrated articles and stories, podcast interviews and other types of media on a regular basis with the hope of providing an ever expanding, searchable archive of information relevant to pointing dog field trials. This website is dedicated to our ever faithful friend and Strideaway contributor, Bill Allen, whose book The Unforgettables and Other True Fables we published in 2010. Books, caps, note cards, decals...and more unique items...many only available in the Strideaway store! Profits help promote field trials! © 2019 Strideaway ® All Rights Reserved.